At the National Association of Biology Teachers (NABT) conference in Minneapolis this year, there was a little card (above) in the goodie participants were given at the registration booth. The card urged anyone posting content related to the conference to add the identifying “hashtag“, #NABT10, to their postings. A hashtag is a short character string, preceded by the # sign, that serves as a marker. A tag. An indentifier, so that others can find your stuff in the vast sea of information known as the world wide web. For those not able to attend the conference, the hashtag made it easier to tap into the stream of content coming from the conference – photos, blog posts, tweets (from Twitter), Powerpoint slide decks – any of those items posted online that include the hashtag “#NABT10” can be easily found. Here’s an example. If you go the web site Tweetchat (a Twitter application that makes it easy to search Twitter with a particular hashtag), you can pull up all of the Tweets posted with that hashtag. Here’s a glimpse of those (the real list is much longer and must be scrolled through). In that list, you’ll find tweets that I posted during Sue Black and Nancy Monson’s excellent “Biology Best Bets” talk – their fourteenth such talk at NABT. Sue and Nancy give their audience the benefit of their combined 40+ years of teaching experience and shared the most incredibly creative ideas for demonstrations, labs and activities. So, even if you weren’t with us in the room, you could get a “feel” for their talk from the tweets. Not only that, I included the link to their handout (the url of which they gave us during the session) in one of the tweets. It’s the next best thing to being there. Here’s another example. On Saturday morning, Richard Dawkins gave a featured speaker address – a Q/A session, attended by every biology teacher there. The room was packed. Scrolling through the list of tweets, you can see that both Stacy Baker and I were “live tweeting” the session, passing along quotes and summaries from the points that Dawkins was making. And another. Brad Williamson took photos of all of the 4-year divisions poster session posters on Friday evening and posted them in a Flickr slideshow. Since he added the conference hashtag, that slide show is a breeze to find. A little hashtag like this….just seven characters long….might sound like a small thing, but it’s a big step forward for the NABT organization. A sign of good things to come as this community steps into the future in order to begin to realize the benefits that social media and online communities can offer to the NABT membership. 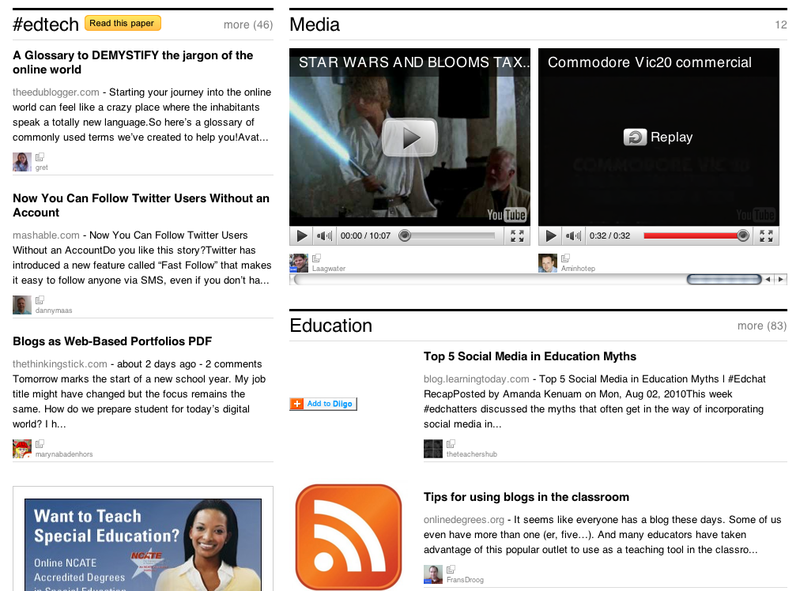 If you’re an educator, looking for a reason to get up to speed on Twitter, take a look at Edchat. This is a live event that happens each Tuesday at two times – 12pm EST/ 5pm GMT and 7pm EST/ 12pm GM – on Twitter. Educators from all over the world chime in with their answers to a question, proposed by the organizers, Stephen Anderson, Tom Whitby, and Shelly Terrell. Here is Shelly’s blog post, describing Edchat. Each week, the Edchat topic is voted on by the group. You can send suggestions to Shelly, Tom or Stephen and then, on Monday of each week, they post five possible topics. The topic with the most votes becomes the Edchat topic for that Tuesday. 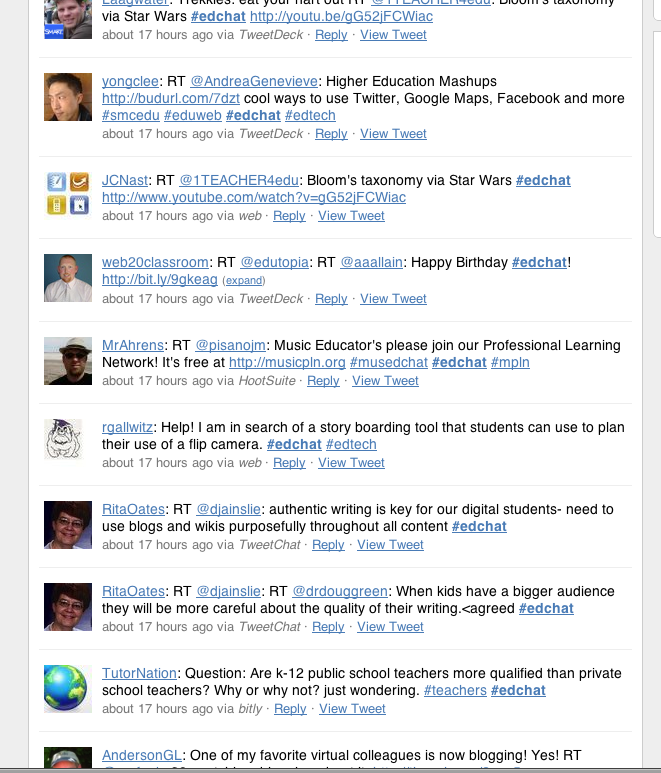 Any Tweet that bears the hashtag – #edchat – will appear in the stream. You can either search on the hashtag to pick up the stream, run it through an RSS feed, or if you’re using Tweetdeck (a sort of dashboard for Twitter), you can set up a column just for that steam. Here’s a video tutorial on how to use Tweetdeck to monitor the stream. If you have questions about how it works, you can get in touch with the moderators. For the 12pm EST #Edchat the moderators are @ShellTerrell and @Rliberni. 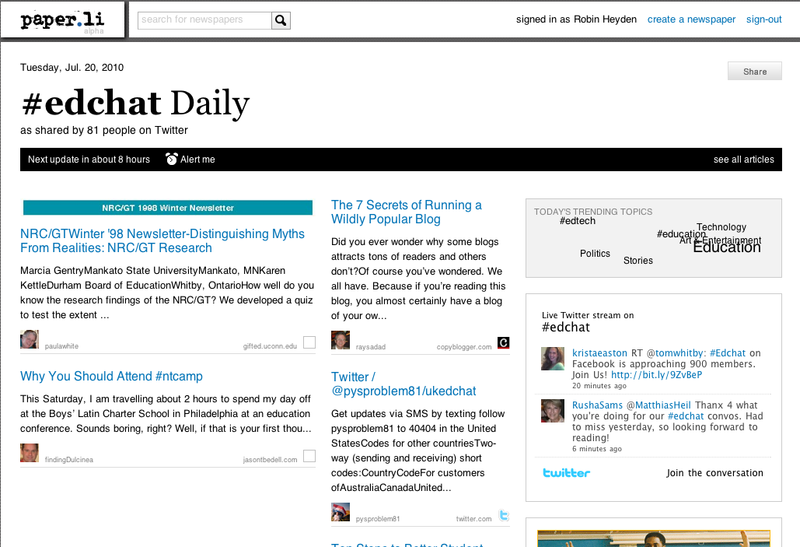 For the 7pm EST Edchat the moderators are @MBTeach, @KylePace, and @TomWhitby. People pose questions and answer them. They contribute suggestions, links, anecdotes, and arguments. It’s a very lively bunch. In addition to the quality of the Tweets (mostly quite high), what struck me most was the power of the medium. Here I was, in my own home, listening to 1000’s of smart, savvy educators – from all over the world – chime in on a conversation about a topic that interested me. It’s the kind of experience you live for when you attend a national conference – that chance meet up in hallway or over a beer, where a group of interesting professionals gather for a few moments and exchange really helpful ideas about something important. But this “meet up” was scheduled and it included 1000’s – and I didn’t have to get on a plane to listen in. A global brainstorming session, with (according to “what the trend“) 3500 contributions. I was also struck by the courtesy of the group. People responded to each other, supported concerns, and thanked each other for suggestions. No flamers here – what a welcome change. The organizers have also started a Personal Learning Network (PLN), using Ning, for those educators who want to continue the conversation. On the Ning site, I see that some educators have formed subgroups to start projects at their own schools or carry on a conversation about a related topic. Nice. And here’s where I get to repeat a frequent (not-original) conclusion of mine – these participatory media tools are so much more powerful when they are used in combination with each other. In this case…. Twitter, a Ning site, and a wiki. Magic. I can say that I haven’t always FULLY understood the power of Twitter, but occassionally, I’ve glimpsed it. In that way that you struggle to remember a really good dream upon waking. You get shards of it and your brain attempts to piece it together. Well, another shard just fell into place for me with paper.li. This is an online service that takes a Twitter feed and turns it into an online newspaper – with most often followed tweets organized into categories like politics, business, education, arts & entertainment. 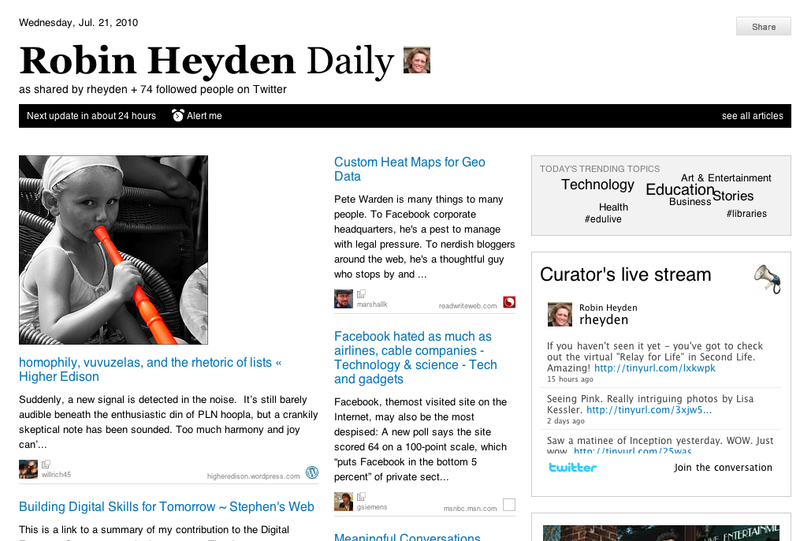 Similarly, you can build an online “newspaper” of your own twitter feed thereby seeing at a glance all that you’ve read, followed, linked to in various categories. It separates out tweets that include media (videos, photos, etc) that you can horizontally scroll through, coverflow-style, It also gives you a word cloud of the trending topics for that stream. You can act from your paper.li page as well – replying, following, unfollowing just as if you were in Twitter. For me, examining a Twitter stream this way makes it much easier and more efficient to spot trends or emerging information. That’s a screen shot of my own Twitter stream, turned into a Paper.Li newspaper. Examining your own Twitter stream this way should help make clear to you the strengths and weaknesses of the people you are following – a good assist to prune (or beef up) your list. This tool really puts a high beam on the power of Twitter as a filter for listening. In that hurly burly conversation going on out there on the interwebs, how lucky we are to have these (free!) tools to help up sort, align, listen, and digest.